If you live in Pennsylvania and PECO (formerly Philadelphia Electric Company) is your utility, you are able to shop around for your electricity from different retail electricity providers. By shopping around, you are able to find lower rates and better plans that best fit your needs, and PECO will continue to deliver your electricity with the same service and reliability. In fact, PECO encourages their customers to shop around. Since deregulation was fully completed in 2011, PECO has been required to buy its electricity and sell back to the customer at no profit. Therefore, PECO has no incentive to compete for customers – since it’s only able to profit from the delivery of the electricity, and not the sale of actual electricity. Below you will find information that can help you find the best retail electricity provider for you and your home or business. Once you’ve found the ideal provider, switching is easy. PECO is the largest utility in Pennsylvania. 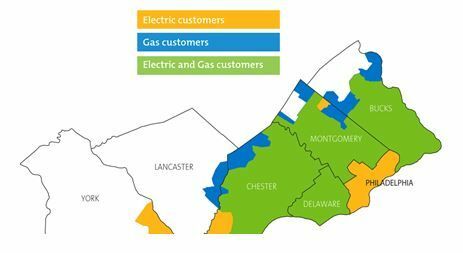 The utility serves almost 1.5 million residential electricity customers and over 150,000 commercial and industrial electricity customers in six counties in Eastern Pennsylvania. At ElectricityRates.com, we work hard to provide you with the most relevant and up-to-date information to help you make the best retail electricity choice for your home or business. We do not represent any retail electricity provider, we’re simply here to save you money and help you find the right option. You’ll find an easy, FREE tool on the right side of this page that does the hard work for you. Type in your zip code in the box, click the search button and then compare PECO electricity rates, providers and plans. The provider you select will need to know your account information, so be sure to have your most recent PECO bill on hand. PECO will immediately be contacted by your new provider. You will begin to see your new provider on your PECO bill in one to two billing cycles.